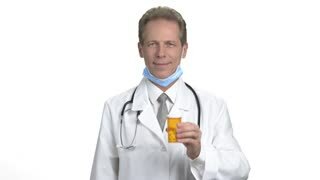 Portrait of mature doctor approving can of medicine. 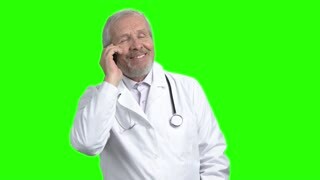 Cheerful smiling caucasian physician holding pills in one hand and and thumb up in another in white isolated background. Portrait of smilng senior grey hair physician with smartphone. 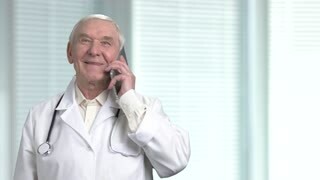 Joyful old happy cheerful doctor in white uniform smiling and talking on the mobile phone. Blurred windows with jalousie background. Cheerful mature physician smiling portrait. Handsome smiling male doctor with stethoscope looking at camera, white isolated background.